The development and testing of precision ballistic and guided weapons require the occasional discharge of those weapons. For newer weapons with greater operational envelopes, this often requires testing over very large areas. To meet this growing requirement, weapon testing and training has migrated from land based firing ranges to offshore ranges, such as the U.S. Air Force (USAF) Eglin Joint Offshore Test and Training Area in the Gulf of Mexico near the northern coast of Florida. Offshore ranges pose a challenge for determining the location of impact. On land an impact can be sighted and measured after the event, while at sea an impact can only be observed at the moment of occurrence. This observation must also account for absolute position, which is difficult in a marine surface environment without any permanent physical landmarks. Several methods have been used to determine the location of an offshore impact event. All these methods rely on knowing the location of the observation point and the direction or distance to the observed event. Use of the Global Positioning System (GPS) provides the primary method for determining the location of the observation sensors. Direction can be measured by sighted instruments such as optics or radar, while distances can be measured by active radar and passive underwater acoustic arrival time. The Tactical Acoustic Realtime Geolocation and Training (TARGT) system, developed by Trident Research LLC, is a distributed floating array that provides an accurate and low cost underwater acoustic method for locating offshore weapon impacts in near-realtime, using a time difference of arrival algorithm. This article describes the engineering development of the TARGT system and the results of deployment of the system during weapon trials on the USAF Eglin Offshore Test and Training Area test range. The use of underwater acoustics provides several advantages compared to above-water scoring methods. Among these advantages is the ability to operate during the day or at night, in poor environmental conditions including fog and heavy precipitation, and in broad ocean areas regardless of sea state or depth of water. Surface impact scoring relies on detecting the acoustical signal created by the impact. Underwater transducers, or hydrophones, can detect such signals from several kilometers away. An audio circuit then converts the hydrophone output to a digital record that can be further processed. At a standoff distance of 0.5 kilometer, the impact of a 500-pound weapon generates an acoustical signal that is easily measured by a TARGT Acoustic Geolocation Sensor (AGS). The time of arrival of the signal can be precisely identified and correlated with a time code generated from a GPS receiver. As an acoustic wave propagates through an array of AGS sensors, each sensor detects the wave, computes a signal arrival time, and relays the time and its position to the shipboard command and control system (CCS). Once the CCS has acquired at least four event-timing messages, it computes time difference of arrival (TDOA) values that are then evaluated in a trilateration algorithm to determine the location of the weapon impact relative to the array of AGS sensors. Variations in depth, temperature, and salinity may cause fluctuations in the aquatic velocity of sound. However, TARGT is unaffected by these variations as the physical properties of the ocean can be considered homogeneous in the vicinity of the test area. Any minor variations that are present will appear as a consistent bias across all the sensor records and will not affect the least squares fit in the trilateration algorithm. Other factors such as ambient noise, geometric attenuation, and absorption of the signal cannot be neglected. Experience has shown that by limiting the array size to roughly 2×2 kilometers, an ample acoustic signal budget exists to recognize the weapon impact from the background noise. The TARGT system has also demonstrated the ability to detect the impact of the weapon on the bottom of the sea floor. This can provide an additional benefit for organizations that wish to recover the deployed weapon from the sea floor for diagnostic inspection. The U.S. Navy developed some of the early acoustic-based weapon surface-scoring capabilities in the mid- to late-1970s. These systems, such as the Sonobuoy Missile Impact Location System (SMILS) and the Barking Sands Tactical Underwater Range (BARSTUR), commonly used an array of transducers mounted and surveyed on the sea floor. With the advent of GPS, significant advances have occurred in acoustic-based scoring, principally in improving accuracy and portability. Two prominent systems developed by the Navy in the mid to late 1990s include an aircraft-deployed broad ocean area scoring system and a ship-deployed version that utilized self-propelled autonomous surface vehicles. Although both of these systems significantly improved the performance and reduced the cost of weapons scoring, both remain principally data collection systems, providing weapon impact score only after post-mission data processing. The most recent Navy effort has been the Integrated Maritime Portable Acoustic Scoring and Simulator (IMPASS) system, which can provide near-realtime scoring, but cannot meet weapon testing accuracies. The TARGT design team played a major role in the development of two Navy underwater acoustic scoring systems fielded in 1994 and 2000. From this experience, motivation and ideas arose for a more effective system with commercial marketability. By applying state-of-the-art consumer-grade technologies, the team set out to design a system that would exceed the performance of these earlier systems while reducing acquisition, operation, and costs. • an architecture built upon readily available commercial off the shelf (COTS) components to minimize cost while maximizing flexibility to support multiple applications. Initially, TARGT began as a cylindrical prototype built from PVC pipe and available COTS components. Circuit designs were developed, built, and tested to precisely time the detection of a munitions acoustic signal, incorporate the timing and positioning data from a GPS receiver, and coordinate the communications and realtime triangulation algorithm for the command and control system (CCS). By far the greatest challenge in the development of TARGT was precise acoustic timing. For underwater acoustic triangulation, the ability to precisely time the arriving signal is directly proportional to the accuracy to which a score can be produced. With an approximate speed of sound in water of 1,500 meters per second, timing delays of as little as 1 millisecond lead to ranging errors of 1.5 meters. To meet the accuracy goal of sub-meter accurate weapons scoring, Trident expended significant effort in designing and validating an acoustic detection and processing capability to achieve a roughly 15-microsecond timing accuracy. Parallel to the sensor development was the development of a realtime CCS built upon a Linux operating system. 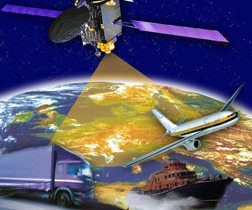 The CCS provides a means for command and control of each sensor, monitors the AGS array status, and upon receipt of sufficient acoustic event messages, computes the realtime impact position using a trilateration algorithm. Developmental testing commenced on a component-by-component basis, with the acoustics, GPS, communications, and command and control system software all designed and tested independently in the laboratory and again following system integration. Full system acoustic detection, RF data communications, and impact event localization processing was carried out on the bench using known acoustic source signals, electronics testing equipment, and simulation and modeling software. When system testing was ready to progress to an operational environment, we incorporated batteries, electronics circuitry, and a hydrophone into the prototype sensor housing. The first series of floating tests, conducted in swimming pools and in three nearby lakes, provided performance data on timing precision and accuracy, and on GPS positioning accuracy in an aquatic environment. These tests also served to provide a basis for design upgrades to the sensor hull, buoyancy, metacentric height, and operator deployment and recovery handling. Having served its purpose, the PVC tube was replaced by a machined aluminum hull tube, with ends fitted for O-rings. Various mechanical configurations for sealing the ends of the tubes were tested. The sensor hull design needed to not only provide water-tight integrity, but also provide penetrations for hydrophone and radio cables, a structural support for buoyancy ballast and an RF antenna mast, and lateral stability to ensure robust GPS tracking and RF communications. Three-dimensional CAD tools were used to model and draft the housing in the latter part of the system development with the final AGS design shown in the accompanying photo. We then conducted open water tests with the aluminum sensor hulls to verify AGS-sensor RF command and control, acoustic detection, GPS timing and positioning, data transmission reliability, and CCS processing. The open water tests also provided an opportunity to test buoyancy, weight distribution, and flotation collar schemes. At the end of first-run production testing, we identified and implemented design changes in the areas of acoustic circuitry, RF radio configuration, mechanical hull sealing, and onboard data storage. We integrated programmable gain circuitry into the acoustic electronics board. This new feature allowed us to remotely adjust the acoustic gain in response to local environmental conditions on the day of the test. Regarding the RF radio, we identified and isolated an internal electronic noise source and optimized radio-modem settings to improve the reliability of data communications. The hull sealing clamps were modified so that they could be mechanically screwed into the base hull to provide greater strength at the upper seal. We also welded the bottom plate to increase hull strength and prevent water intrusion. We also designed and implemented an on-board data storage capability using microcontrollers, flash memory chips, and an SPI communication routine. This new internal recording capability provides four hours of GPS and acoustic event data recording; a sufficient amount to perform postmission data processing, if needed. The AGS sensor firmware was modified to provide more functionality and situational awareness at the command and control system (CCS). These modifications included: built-in self test of basic functions, permanent unit identification, transmission time synchronization to mitigate data collision over the air, preset onboard data record timing, battery lifetime checking and report, and memory state (on/off) and remaining data recording availability. During this refinement effort, the opportunity arose to test the TARGT system during several weapons tests at the Eglin Air Force Base (AFB) Joint Offshore Test and Training Area (OTTA) against the Eglin AFB Instrumented Target System (ITS). The deployment and testing of TARGT during actual weapons tests provided not only a realistic operational environment for validating the system, but also benefited the Air Force by providing an additional independent means of weapon scoring. Flight test preparations for the OTTA missions include preparation and deployment of multiple sensor systems, including the USAF 46th Test Wing’s Instrument Barge (IB) and ITS. The IB is a 40×140-foot, four-point moored platform for supporting multiple high-speed digital video and data cameras, high accuracy GPS receivers, and RF communications modems. The IB also hosts the command and control and communications networks essential for remote ITS management after the range is cleared of personnel. The ITS is a smaller moored target platform equipped with multiple GPS antennas for determining the precise attitude and location of the platform relative to the Eglin AFB GPS reference tower on Santa Rosa Island, Florida. The ITS is also equipped with replaceable deck witness panels, which provide a definitive physical impact point on the platform. In determining the exact truth coordinates, the x-y distance of the weapon impact point on the witness panel are manually measured relative to a fixed GPS antenna location on the ITS platform. We account for the platform orientation by applying a three-dimensional orientation correction using GPS-derived attitude information. The ITS GPS antennas’ positions are then determined through carrier phase–based differential GPS (DGPS) processing relative to the ground reference tower on Santa Rosa Island. Dual-frequency, 24-channel all-in-view GPS receivers, and survey grade choke-ring antennas, provide for sub-meter accurate positioning of the ITS over the 21 mile (34 km) baseline. DGPS postprocessing of the mission data set produced forward and backward solutions that we combined in a weighted solution to provide the best estimate of position. Postprocessed, absolute accuracy is estimated to be 20 centimeters (1 sigma). In preparation for field operations, each TARGT AGS sensor is assembled on the deck of the support vessel prior to deployment. Assembly and checkout procedures include installation of the RF antenna mast, preparation of the mooring assembly, and a communications, GPS tracking, and acoustic check of each sensor from the shipboard CCS to ensure that all sensors are operating nominally. The relatively small size and weight of the AGS sensor allows for deployment by a single operator from almost any size ocean vessel. For OTTA missions to date, the deployment vessel has been a 30–40 foot chartered fishing or sight-seeing boat. Deployment of six to eight AGS sensors requires approximately 40 minutes, regardless of sea state condition. Sensors are typically placed around the impact site at a range of 200 to 500 meters from the intended impact point to ensure good geometry for scoring. 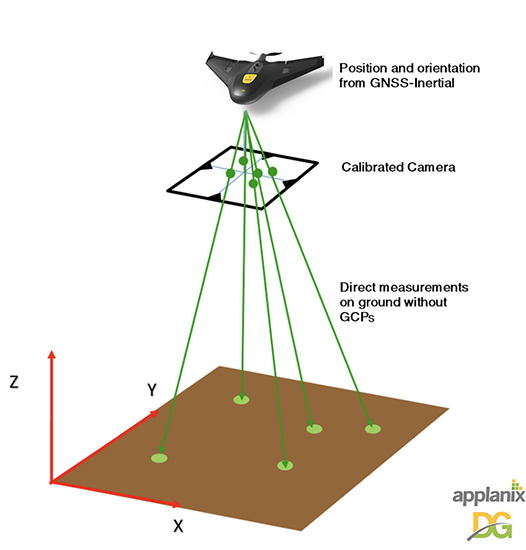 Good geometry is defined as sensor placement providing a horizontal dilution of precision (HDOP) of less than one, and providing direct-path acoustic signal reception. Placement of sensors in a specific location is not required. During operation each AGS sensor periodically reports its status and position information, allowing the CCS-equipped support vessel to monitor the status of the AGS array during the mission. The AGS information is also used to compute range and bearing to each sensor to facilitate recovery. Upon detection of an acoustic event greater than observed ambient noise conditions, each sensor immediately reports the event time to the CCS. Once four or more event messages are received, the CCS computes a realtime two-dimensional geodetic position and estimated error ellipse for each event. Events spaced more than 0.5 seconds apart can be individually determined in realtime by the system. Following weapon release and impact, the support vessel returns to the test area and commences recovery of the deployed AGS sensors. Sensor recovery is typically performed by a single operator in approximately 45 minutes; however, additional time has been required under severe conditions (greater than sea state 4). We perform postmission DGPS processing that combines dual-frequency receiver data with the AGS sensors’ 12-channel single-frequency receivers’ GPS data to produce a precise relative position vector for each AGS sensor at the time of impact. These improved sensor positions are used to reproduce a refined impact score for the weapon strike. This process results in an absolute WGS84 geodetic impact score relative to the Eglin AFB Santa Rosa Island reference tower. On March 12 and May 25, 2004, three precision weapons were deployed in OTTA missions approximately 22 miles south of Destin, Florida. The ITS truth and TARGT systems were successfully deployed for both operations. In each mission the TARGT system successfully produced realtime impact scores within 5 seconds after the weapons struck the water. The accuracies of the realtime scores were within 5 meters (2D RMS, 1 sigma) of ITS-determined truth for all three weapons. The post-mission score for each weapon was produced within 24 hours of system recovery. Following report of the post-mission TARGT scores to the 46th Test Wing, the final scores produced by the ITS truth system were provided to Trident Research. 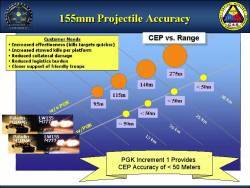 The post-mission scores produced by the TARGT system indicated accuracies within 3.7 meters of truth for all three weapons, with a mean accuracy of 2.47 meters (2D RMS, 1 sigma). On November 15, 2005, the TARGT system was deployed in support of a three-weapon mission at the OTTA. One of the principal goals for this mission was to determine if the system could detect the impact of a weapon on the sea floor. The ability to time the sea floor impact would provide a position and estimate of the velocity of the weapon upon sea floor impact. These two quantities provide an ability to determine the likelihood that the weapon survived the impact, and a location to assist divers in possible recovery of the weapon for diagnostic examination or for environmental remediation. In addition, if both surface and sea floor impact strikes are accurately positioned, the entry angle of a weapon through the water may be approximated. Residual errors would include unknown variables such as surface deflection and variations in subsurface trajectory caused by asymmetrical body damage at surface impact. In post-mission processing of the digitized acoustic files, compelling evidence indicated that the weapon strikes on the sea floor were detected with sufficient fidelity to time the accuracy to within five milliseconds. Sea floor impact times ranging from 135 to 165 milliseconds after surface strikes were observed from multiple sensor positions by multiple depth hydrophones. Additional testing is planned to refine the processing and analysis methods for a ‘turn key’ sea floor impact scoring capability for the TARGT system. A second objective of the November 15 mission was to determine how accurately TARGT sensors could be positioned using differential carrier phase–based processing. The predicted TARGT error budget indicates that sensor positioning errors as high as 60 centimeters (2D RMS, 1 sigma) would result in an impact score with an estimated error of less than 1 meter. To achieve this objective, TARGT sensors were equipped with versions of the single-frequency 12-channel GPS receivers capable of carrier-phase tracking. Postmission processing of the sensor GPS data demonstrated positioning accuracies ranging from 30 to 40 centimeters (1 sigma) during the mission window. This result successfully validated the GPS portion of the error budget for sub-meter TARGT scoring. The next planned OTTA mission will be the final validation test for TARGT and will demonstrate the ability to attain a level of accuracy never before achieved in underwater acoustic-based weapon scoring. The TARGT system has met or exceeded the initial design objectives. The acquisition cost is sufficiently low that each sensor can be considered an expendable item when retrieval is deemed too expensive or dangerous. The size of a TARGT sensor supports deployment and retrieval by one person. Internally, the electronics of the system are modular and designed with an open architecture approach; so, improvements and modifications can be rapidly integrated. Three separate military weapons tests have proven the success of the design and have provided useful data as to the systems reliability and performance. Future plans for the TARGT system will depend on mission requirements, but a minimum objective is to validate weapon surface impact scoring with submeter accuracy and sea floor impact scoring. Additional modifications are being reviewed to evaluate the possibility for more advanced acoustic processing for such applications as mammal detection for range clearance and swimmer detection for harbor security. Trident Research has also integrated robust satellite communications and autonomous stationkeeping into other marine instrumentation and is reviewing the adaptation of these capabilities into the TARGT system so that larger, relatively fixed networks of sensors can be operated and controlled from anywhere on the globe. In addition, advances in other remote sensing technologies, such as chemical monitoring, short range radar, and video imaging are being investigated with the intent of expanding the utility of TARGT. The design team at Trident Research is well versed in these technologies and is looking forward to aiding weapons system designers and developers as they continue the migration of precision munition testing to the sea.